The time has come for the TØP-loving superstore to reach our hallowed UK shores. Hot Topic, the US-based store of the emo gods, has been in rude health lately with young fans flocking to their local branch in order to stock up on Twenty One Pilots merch, Disney-themed funko pop dolls and whatever else their hearts may desire. And for a brit abroad, a trip into those darkened mall aisles was always a bonus holiday treat, particularly as a younger kid in an early-internet, pre-international shipping world when an Easter break to Orlando was the only chance all year to browse through the merch. Now, of course, we can all grab whatever Panic! tee or Twin Peaks onesie we want on the web with the click of a button. But it's just not quite as exciting as the experience of entering that famous storefront is it? Because for many in smalltown USA, Hot Topic is almost like an emo clubhouse, giving refuge and a meeting place to scene kids of all ages. They hold signings and mini gigs by your fave bands. They offer a wide vinyl selection you can flick through to discover your next fave band. In a great deal of cities across the states, their aren't a lot of places you can do that sort of thing. It is this appeal that has kept the brand growing for years and, as a Brit no longer abroad, I would love to have the opportunity to mingle with fellow FOB fans in the poster section without having to spring for a plane ticket. 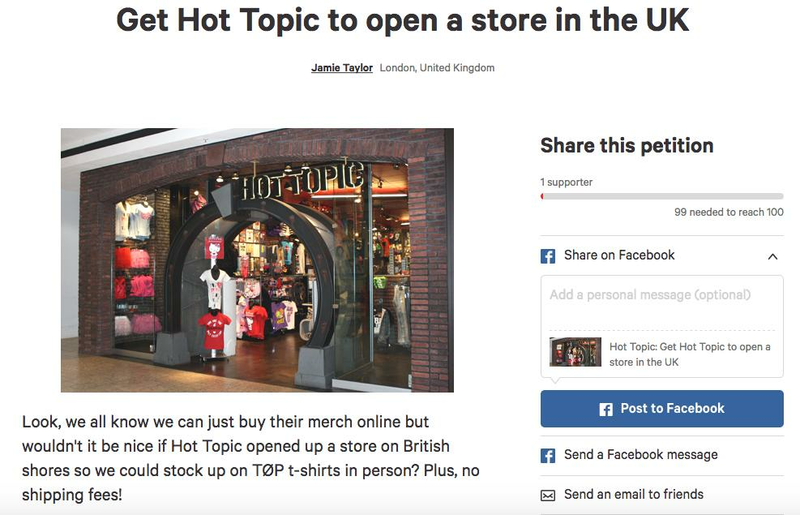 So, Hot Topic, we need you to do what we all know is right - it's time to set up a UK store. Yeah, yeah I know it will be expensive and you'll simply point us to the mail order page of your site. But the British emo kids need you guys dammit. They need their very own store. 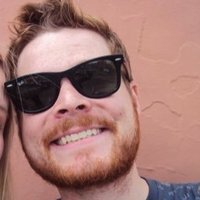 That is why, Hot Topic, I have set up a petition at Change.org to demand you rectify this situation and give us all access to the State Champs t-shirts you know full well that we deserve. If you wanna sign it, head over here. Then maybe, just maybe, we can soon pick up our MCR-inspired guyliner on Tottenham Court Road.